4) Banksy to do a portrait of… Madonna? Indoors? Oh, and he takes superstar commissions now, huh? 5) Tate Modern’s street art exhibition – outside! What started all this? Well, probably Banksy. 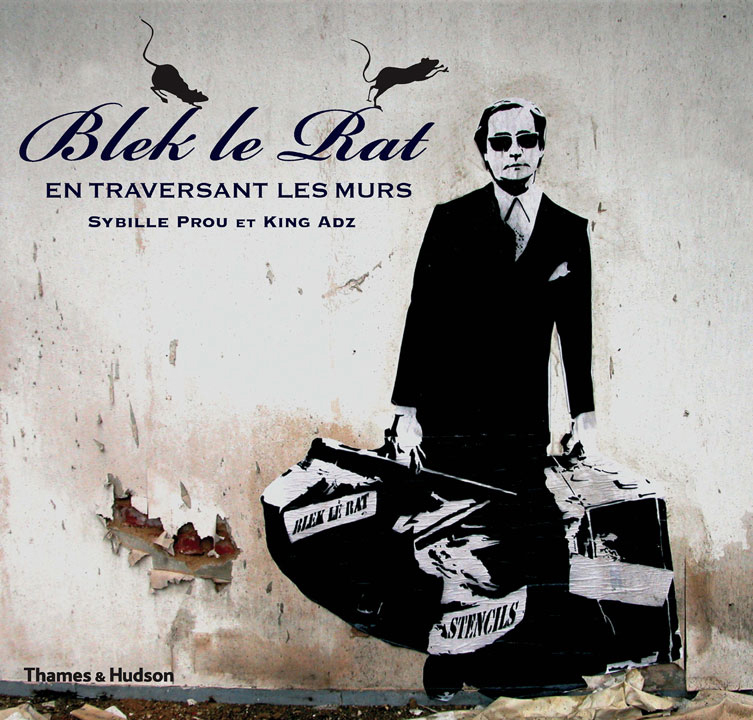 But where would he be without the lovely, cuddly Blek le Rat, shining star of Tate Media’s Street Art DVD, Painting the City: London, Paris, Madrid? 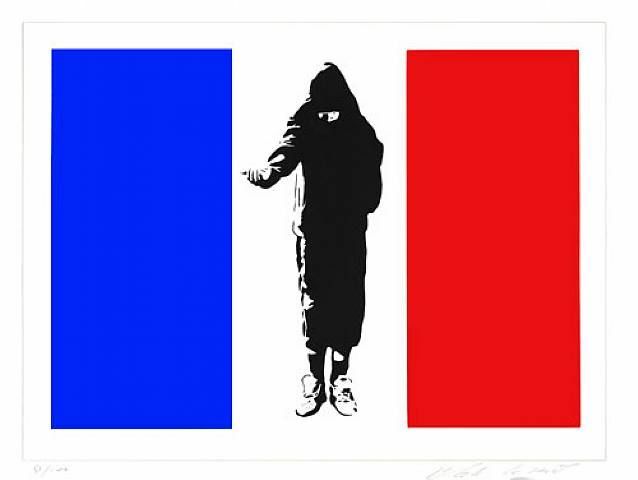 Blek’s been doing this over in Paris for years. Unlike quite a few of the artist talking heads featured here, Monsieur le Rat does not appear in disguise. A 1990 court case put paid to Xavier Prou’s anonymity. He started with some rats in 1981, and, on this DVD, cites a 1971 visit to New York with giving him the first kernels of inspiration. “I wanted to invade Paris with my images,” he says of his early works. There is an innocence to his memories of why he did it, completely unlike the commercial wrangling over Banksy’s identity and art today. As le Rat says, “I wanted to meet people and get accepted by people, more than to get famous.” In light of his comments, his initial anonymity can be seen as a way of his work being judged, rather than receiving that treatment himself. However, Banksy is locked into his present anonymity; surely his current stock would fall drastically if he was really revealed? In contrast to Blek le Rat, some of the contemporary British street artists come across as, well, a bit middle-class and art-schooly. I’m talking to you, Sweet Toof, and Pure Evil, two of only a small minority of artists on the DVD who disguise themselves. Nothing wrong with disguise or art school or middle-class-ness in themselves, although their possession of these attributes backs up sceptical art critic JJ Charlesworth‘s view: “They’re making money out of a pose, and the pose is rebellion.” Sweet Toof went to art school and learnt his trade there; he says, “we’re educated vandals.” See also: the neat little cyber-shop on his website. He’s a Web 2.0-enabled vandal! 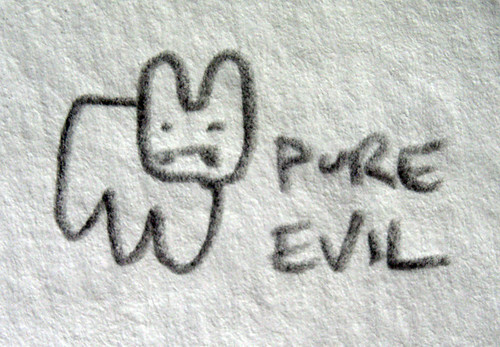 Pure Evil is as well. Cute! That’s from Pure E’s Flickr. In comparison, it’s amazing how Banksy has kept his anonymity and resisted the temptations of a little self-promotion. If you’re one of the first and best-documented, though, you don’t really need to. The last bit of the film cuts to an auction. Selling graffiti is now more lucrative than ever. But is taking street art out of its context and dropping it into a gallery or some gazillionaire’s little hideaway robbing it of its meaning and purpose – if it has either? As Monsieur le Rat says, “There is no city in the world without graffiti,” and Charlesworth concurs, saying,”I don’t think it’s a fad.” There will always be people looking for immediate access to a huge and varied audience, which is found on the streets, rather than anywhere inside. It’s a nice way of saying, attention-seekers will carry it on, ad infinitum. How do you feel about the growing relationship between graffiti and the art world? The problem with galleries is that… 99% of urban artists use urban art as a stepping stone into the galleries. It’s a fatal error because in galleries they’re seen by 40 people, in museums they’re seen by 10 people, but in the streets they’re seen by 100,000 people. And that’s the integrity of an artist’s work: to be seen. Not be sold or to be recognized in a museum—but to be seen by the world. But then you get artists like Eine, who’s decorated the outside of 333 Mother on Old Street, who says, “It’s a dream of mine to make a living selling my stuff.” You can’t blame the up-and-coming, street artist or otherwise, for hankering after a payrise. Thanks to Naomi Richmond-Swift at Tate Media for the review copy.